An endotoxin is a lipopolysaccharide (LPS) found in the cell wall of gram-negative bacteria. It is a typical pyrogen, which induces various biological reactions when even a small amount of pg (10-12 g) or ng (10-9 g) enters the bloodstream. Due to its heat resistance and stability, complete inactivation of endotoxin is not possible with autoclaving. Dry heat sterilization for at least 30 minutes at a temperature of 250 °C or more is required complete initiation, It exists in the environment (e.g. water, air) inhabited by gram-negative bacteria, and bacterial endotoxins (LPS) remain even after the bacteria die. Figure 1 shows the LPS structure schematic, which illustrates lipid A as the component responsible for the bioactivity. The molecular weight of this portion is approx. 2,000. The entire molecular weight, including the sugar chain moiety, is usually approx. 5,000 to 8,000. However, since an LPS consists of a hydrophilic region (sugar chain) and hydrophobic region (lipid A), it associates in an aqueous solution to form a micellar structure with apparent molecular weight of hundreds of thousands to several millions. A change in the micellar structure reportedly influences the strength of bioactivity. 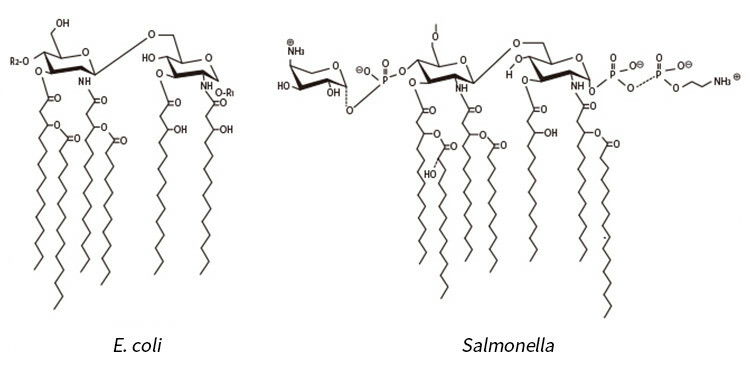 Figure 2 illustrates the structures of Salmonella-type and E. coli-type lipid A, which indicate that the basic structure of the lipid A is in common, regardless of the strain variation. 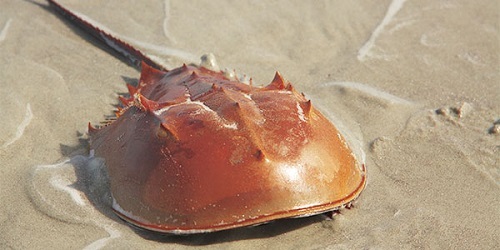 A lysate reagent prepared from the amebocytes of horseshoe crab (Limulus polyphemus) is used to detect bacterial endotoxins. As shown in Figure 3, the cascade reactions start by the presence of an endotoxin, whereby Factor C, a serine protease precursor, is initially activated. 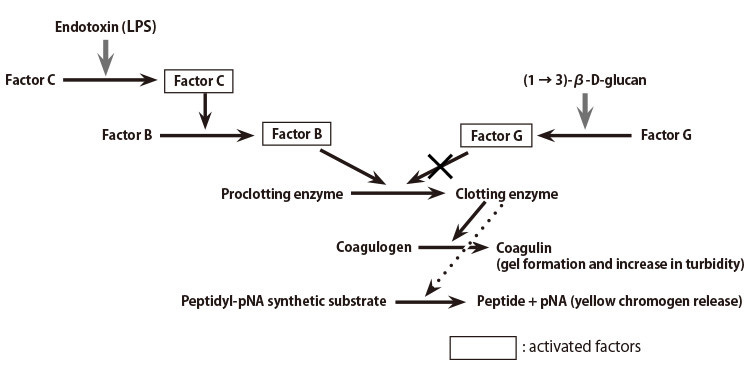 There follows the subsequential activation of Factor B, also a serine protease precursor and a proclotting enzyme, which hydrolyzes coagulogen into coagulin, forming an insoluble gel. In LAL tests, endotoxin can be quantified in three ways: measurement of gel formation, increased turbidity, or a yellow chromogen released due to the synthetic substrate cleavage. 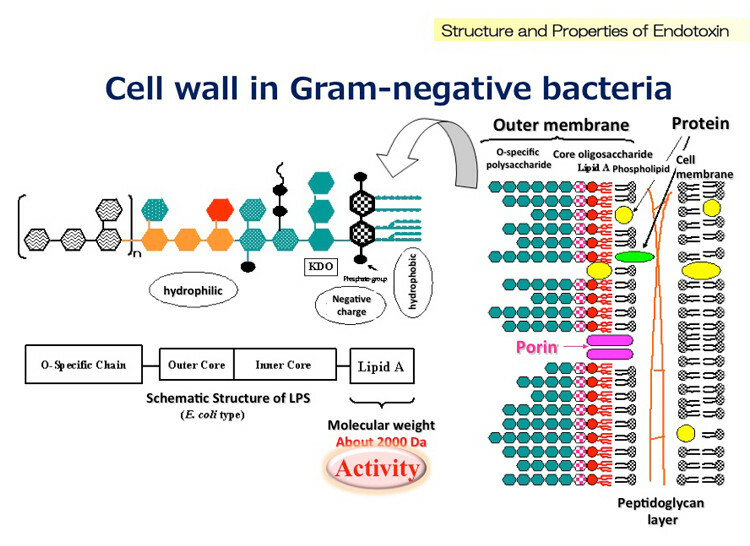 Ordinary LAL reagents react not only with the endotoxin but also (1 → 3)-β-D-glucan (a fungal cell wall component), since the Factor G pathway can be activated in the reagents. To eliminate this (1 → 3)-β-D-glucan activation, various endotoxin-specific reagents are being developed in industry by removing Factor G or inhibiting its activation. Various LAL reagents are commercially available, as well as measuring systems based on the Figure 2 reaction mechanism. It is essential to select the most appropriate product depending on the required accuracy, test frequencies, number of samples and other relevant factors. Pharmacopoeias in the U.S., Europe and Japan refer to three means of endotoxin detection, namely the gel-clot technique, chromogenic technique and turbidimetric technique, which are detailed in the following sections while introducing the characteristics and application examples of our relevant LAL reagents. Mix a sample with LAL reagent in a test tube and incubate it using a block heater at 37 ± 1 °C, 60 ± 2 minutes, without subjecting to vibration. Upon completion of heating, immediately but slowly tilt the tube through 180°. If a gel has formed and maintains its integrity without deformation or collapse, the result can be determined positive, while it is negative if no gel has formed. During the test, a series of samples is diluted multiple times (usually 2-fold) to check if the result is positive in each sample. The maximum valid dilution or the minimum concentration determined positive is referred to as the endpoint. Invert the tube through about 180?. The reagent is available in a single-type kit with reaction vials containing pre-dispensed reagent for a single measurement, and a multi-type kit for dispensing the required amount of the dissolved reagent into reaction vials. The single test kit is ideal for an assay with a few samples, and the multi test kit for a larger number of samples. Single test is dispensed beforehand in a reaction tube. Multi test is used by dissolving Lysate reagent in endotoxin test water and dispensing necessary quantity of it in a reaction tube or plate. A multi-type kit is used by dispensing 0.1 mL of dissolved LAL reagent into reaction tubes, which is then mixed after having 0.1 mL of the sample added. A single-type kit can be used by adding 0.2 mL of the sample to the reaction vial with pre-dispensed, lyophilized LAL reagent. Endotoxin-specific LAL reagents (not activated by (1 → 3)-β-D-glucan), compatible with the BET (JP) compliance tests. They have the gelation sensitivity of 0.015 EU/mL, and are available in both single- and multi-type kits. This technique uses synthetic chromogenic substrate cleavage to detect the activation of LAL reagent induced by endotoxin. Since the yellow color of p-nitroaniline is measured by absorbance at approx. 405 nm, the technique is not applicable if the sample has considerable absorbance at approx 405 nm. Endotoxin-specific chromogenic technique LAL reagents, compatible with the BET* (JP) compliance testing. A single-type kit combined with a Toxinometer® and a multi-type kit for use in combination with a microplate reader and Toxinometer®are available for kinetic chromogenic testing. These series also feature measurements at the lowest concentration (highest sensitivity) among our reagent products: detection limit of 0.0002 EU/mL (single-type) and 0.0005 EU/mL (multi-type). This technique uses the change in gel turbidity to detect the activation of LAL reagent induced by endotoxin. It cannot be applied to samples with considerable turbidity. Kinetic turbidimetric measurement is available by combining the ES-F series or the ES-II series and Toxinometer® or a microplate reader.These reagent kits can provide gel-clot results while obtaining kinetic turbidimetric data, with the measurement time specified as 60 minutes. All tools used for endotoxin detection must be free from endotoxin and β-glucan. Dry-heating at 250 °C for more than 30 minutes is required to inactivate endotoxin. The use of glassware treated by dry heat sterilization is recommended. Avoid metal tools, since even a small amount of eluted metal ions (e.g. Fe, Al, Ga, Cr) may affect testing. When using disposable plastic tools (not guaranteed by its manufacturer for use for Endotoxin test purposes), check if they satisfy the requirements: 1) Not contaminated by endotoxin; 2) No adsorption of endotoxin; and 3) No eluted substance; in comparison with glassware. Use the appropriate type of standard endotoxin based on the testing purpose. → Reference Standard Endotoxin of USP, EP or JP must be used. → Control Standard Endotoxin (CSE) can be used. Precautions are required against the potential impact (reaction interferences) of samples on endotoxin tests. The effect of samples can be judged by a test referred to as the test for interference factors by Pharmacopoeias: namely, it is conducted by measuring a sample which has been spiked with a known amount of endotoxin and obtaining the recovery of the spiked endotoxin. If the recovery is within the 50 to 200 % range, then the sample is determined as not influential, in other words, the measured endotoxin concentration is correct. If any sample influence is found, it can be reduced by diluting the sample solution for measurement. However, dilution of the sample solution raises the endotoxin concentration value obtained through the conversion to the concentration of the original solution (pre-dilution solution). The possible dilution multiple (maximum valid dilution) is determined based on the desired endotoxin concentration to be detected and the detection sensitivity of the LAL reagent to be used (refer to the Bacterial Endotoxins Test by the Pharmacopoeia for details of the reaction interference factors and maximum valid dilution).